Zola Dubnikova bridges sacred dance, movement medicine, contemporary body science, masterful form, somatic awareness and ritual through her unique approach known as the “Holistic Dance Language.” Her extensive background fused with absolute devotion to the pursuit of dance as an ecstatic, spiritual experience, has birthed a unique style of both teaching & performing – which truly embodies the marriage between form and spirit. 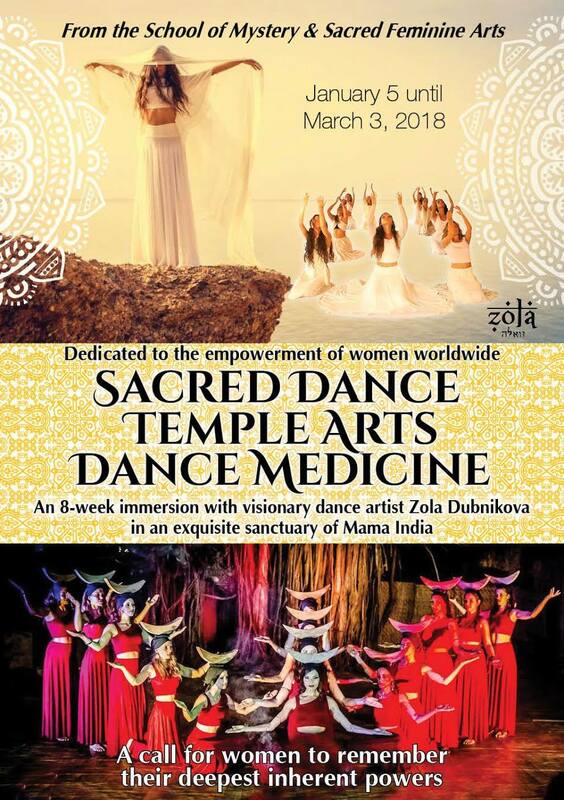 Trained extensively in contemporary dance forms and healing arts as well as Odissi Temple Dance Tradition, Sufi tradition, Mevlana whirling practices, Dances of the Silk Road , the gypsy trails and beyond, her style brings forth the wisdom of ancient dance ritual through a holistic lense intended to guide more people in accessing their divine capabilities. 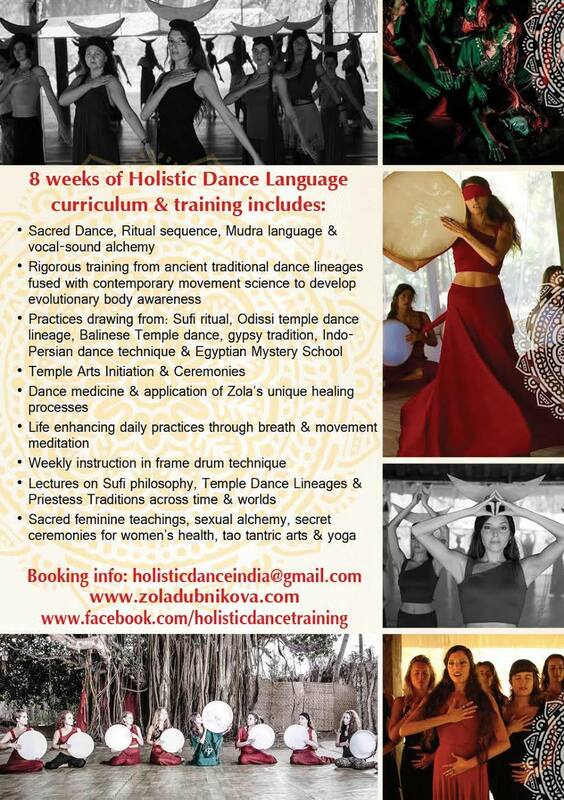 Zola offers intensive trainings in her two primary schools : Temple of Dance (Israel) and School of Mystery & Sacred Feminine Arts (India). With invitations to teach across the world, Zola tours extensively to give seminars, offer retreats, perform and guide collective experiences. We are planting the seeds to open our own temple and school, yet in the meantime, an intensive retreat provides opportunity to practice the foundations of the holistic dance language curriculum in the format of daily practice. When we practice together every day, we begin to feel these unique practices as a way of life, rather than a beautiful workshop that we experience for just a few hours per week or an intensive weekend. Combined with dietary awareness, sustainable lifestyle, strong physical practice, transformative spiritual discipline, and supported by a hand-selected core support team and guest teachers, within a circle of powerful women gathered from around the world, we co-create a recipe for deep evolution. January 4 – March 4, 2019 our yearly deeper immersion takes place once again in India, at our exquisite Samata sanctuary.